1837 Entire headed "Much Hadham" addressed to Daventry "By London" and showing a fine three-line BISHOPS/STORTFORD/PENNY POST in Red, HE121. 1813 Entire addressed to Norwich, written from Bennington, with, on the reverse, a very fine STEVENAGE/32 mileage. 1826 Entire to Norfolk Hotel, Brighton with, on the reverse, a HITCHIN/35 mileage mark. Content regards Storm Damage. 1804 Entire to Olney, Bucks, with, on the front, a HITCHEN/37 mileage, HE 263. 1722 Entire from London addressed "To Mr Ringer att the Revrnd Mr Goodwine at Pirton Near Hitchin in Hartfordshire These", showing a fine 15/MR London Bishop mark on the reverse. 1851 1d Pink envelope addressed to London showing on the reverse a fine BUSHEY-HEATH (Watford) undated circle. 1856 1d Pink envelope to Portsmouth showing on the reverse a very fine BARLEY (under Royston) undated circle. 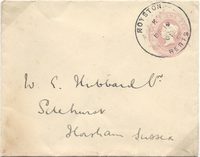 1901 1d Pink Envelope to Horsham cancelled by a very fine ROYSTON/HERTS Skeleton-framed datestamp. 1845 Entire from Bengeo, Hertford to Rettenton Common, Essex showing a circular Uniform handstruck "PAID/HERTFORD/1D" in red and a superb oval MISSENT/TO/CHELMSFORD in black. 1852 REGISTERED LETTER FROM LONDON TO TRING FRANKED BY A VERY FINE BLOCK OF SIX AND SINGLE 1d RED-BROWN, SG8, SPEC B2, PLATE 156, tied by a London Tombstone PAID in red. REGISTRATION 6d, POSTAGE 1d. A RARE FRANKING. 1852 1d Pink Stationery envelope to London showing SILSOE and HEXTON undated circles.